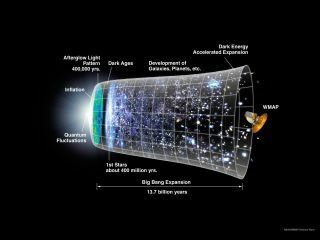 This graphic shows a timeline of the universe based on the Big Bang theory and inflation models. Ouruniverse might have originated from a black hole that lies within anotheruniverse. Theidea centers on how matter and energy falling into a blackhole could in theory come out a "white hole" in another universe.In such a situation, both the black hole and the white hole are mouths of anEinstein-Rosen bridge, popularly known as a wormhole. Withthat in mind, theoretical physicist Nikodem Poplawski at Indiana Universityconjectured that when a black hole forms upon the collapse of a dying star, auniverse is born at the same time from the white hole on the other side of the wormhole. "Ouruniverse could have itself formed from inside a black hole existing insideanother universe," he said. Thisidea has been suggestedbefore, and now Poplawskihas expanded on the thinking. Althougha black hole forming from a star the size of our sun would only be about 2 mileswide, it does not mean that a universe which might originate from a black holewould stay that small. "Ouruniverse was small a long time ago and expanded," Poplawski said. "From the other side, one would not see our expansion." Essentially,a black hole could seem bigger on the "inside" than how it looked tosomeone outside. Ifanyone survived a trip intoa black hole and emerged in another universe, "it would be a one-waytrip," Poplawski noted. The event horizon of a black hole is ?boundary atwhich nothing inside can escape. In theory, black holes do lose mass, however, as Hawking radiation— particles that emerge from the vacuum right next to their event horizons.Black holes that lose more mass than they gain are expected to shrink andultimately vanish. This does not mean any universe at the other end of theblack hole would cease to exist, Poplawski explained. "We would just bedisconnected from the other universe," he said. Evidencefor a black hole birth? If our universe was born from a black hole in another universe, itwould be impossible to cross its event boundary and see the other side, meaningone cannot prove or disprove this idea that way. So how might one test this conjecture? One implication of Poplawski's conceptis that our universe is "closed." "In cosmology, there are three models for our universe,"Poplawski explained. "The first is that it's closed, the second is thatit's 'open,' and the third is that it's 'flat.'" If it is closed, and one tries to venture to the edgeof our universe, one would eventually loop back to where one started. "It would be like walking on the surface of the Earth — if you walk to theeast, at some point you come back across the west," Poplawski said. If our universe is flat, and one tries to venture to its edge, onewould never reach it, as it continued on infinitely. The same would hold trueif the universe is open, "only it would be 'curved,'" Poplawski said.This means that if two beams of light were shot into space parallel to eachother, in a flat universe they would stay parallel, while in an open universethey would actually get farther from each other. If our universe lies "within" another universe,"the prediction would be that our universe is closed," Poplawskisaid. "That could maybe tested at some point. If the universe is closed,if one watches the stars, their light would be visible on the opposite side ofthe sky. If the universe is really big, the light from those stars might nothave had time to do that yet, but maybe at some point we could see this." Also, black holes rotate, evidence suggests, and if our universe'sparent black hole was spinning, "then one direction might be preferred inour universe, evidence we could see at large scales," Poplawski said. If our universe was born from a black hole, it could help solvethe mystery of what came before the BigBang and whether our universe was closed, flat or open. It could also help scientists avoid problems associated withsingularities, or infinitely small points with infinite density. In theory, theuniverse was born from a singularity, and every black hole encloses asingularity. However, singularities are big headaches for theoreticalphysicists, since the laws of physics break down around them. "In my model, when the universe is born, there is no problemof having a singularity initially — instead of being infinitely small, it hadthe radius of its parent black hole," Poplawski said. "Also, insteadof black holes ending up with singularities, this model suggests they would endup with universes." Onehole in this idea is one that turns up whenever wormholes are discussed — exoticmatter. Inprinciple, all wormholes are unstable, closing the instant they open. The only way to keep them open is with an exotic form ofmatter with so-called "negative energy density." Such exotic matterhas bizarre properties, including moving in the opposite direction of normalmatter when pushed. No one knows if such matter actually exists. "It is possible that when black holes form, matter canundergo a phase transition to become exotic matter, to allow this initialexpansion of a universe inside the black hole," Poplawski suggested. Also, while this might explain how our universe was born from ablack hole, it does not explain how the universe that black hole is from cameto be. "So was that universe born from a black hole in another universe,and so on?" Poplawski noted. "It's a problem of an infinite number ofuniverses. That's a very reasonable criticism." Poplawskiwill detail his research April 12 in the journal edition of Physics LettersB.